Hello and happy Saturday to you!! I'm showing you my two choices from Smitten Polish's new Berrydrops collection (There are six in total) and two from the Speck-tacular collection (out of five). Follow Smitten on Facebook. Noelie posts on her blog too, where you can see her own swatches and keep up with what's new. Purchase at her Etsy shop, also available on Llarowe.com. 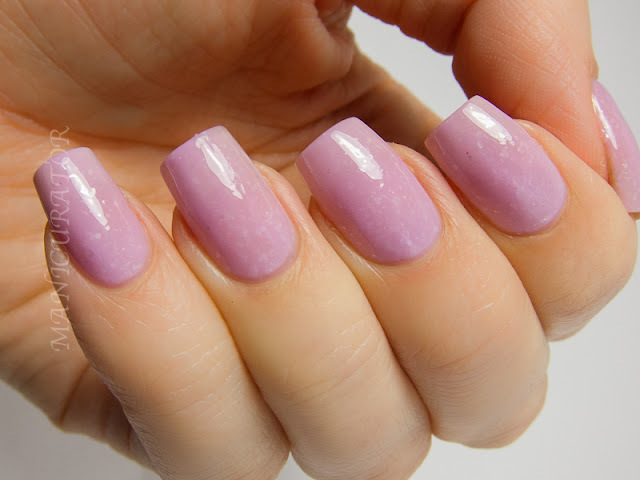 Smitten Polish Snowberry Gumdrop is a light pink crelly with subtle flakies. This is 3 coats with HK Girl topcoat. Smitten Polish Gooseberry Gumdrops is a mint green with subtle flakies. I wanted to try layering for this one so I used 1 coat of Nicole by OPI Alex by the Books as a base, but I still needed 3 coats of Gooseberry for full coverage. I probably should have used 2 coats of the NOPI first. Smitten Polish Cookies and Cream. Three coats. Aptly named. This one is my favorite of the bunch. Smitten Polish Robin's Egg. Three coats. Love this blue with brown speckles! These all gave me a Spring time, feel good feeling! But I liked the formulas on the Speckle ones a bit better. Personal preference, because they all needed 3 coats, but the Speckles felt less bulky on the nail for me. These are all beautiful colors :) Great for the spring/summer! Wow, these all are really pretty! I love Snowberry Gumdrop, and I am not usually a pastel pink kind of person. Must be that subtle glitter in it. Gorgeous! I love Robins Egg, it's perfect!